It seems that Google is going all out with Chromecast for this upcoming holiday season. Hot on the heels of the news that Chromecast is now usable with 10 new applications, today Google has announced that it is getting even more accessible. 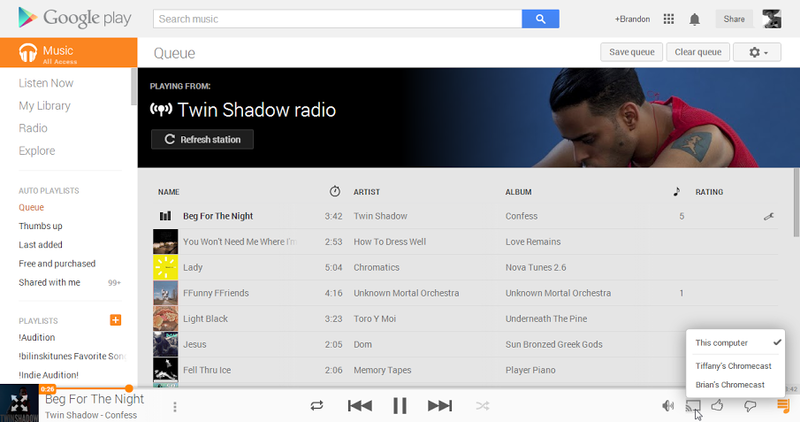 Google’s own Play Music and Play Movie services are now easier to use with Chromecast. Before today’s upgrade, Play Music and Play Movies could be streamed through Chromecast, but you had to go digging for the option. Google has gone through the trouble of placing a button along the bottom side of your playing Music or Movie controls so that you can figure it out a little bit easier. A simple click on the Chromecast button in your controls area will let you choose where you want to cast to. With all this new support and the Nexus 7 bundle going out as well, how well do you think Chromecast will do this holiday season? Have you still not picked one up? Slight Hardware Tweaks Already Being Made to the Nexus 5?